← Artemis, Moon Rock, Dilettante, and Jello Wrestling? It’s the Iron Writer 2015 Spring Open! 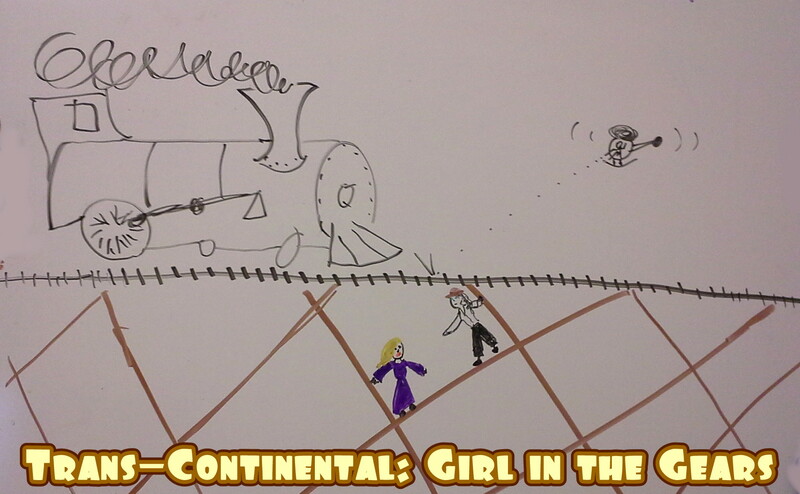 Whiteboard Wednesday: Another peek at Trans-Continental – Girl in the Gears! Ida and Duffy are in a tight spot! For this Whiteboard Wednesday, I’ve doodled you a scene from the upcoming Trans-Continental episode, Girl in the Gears! This shows why “Ida and Duffy… put the ‘team’ in Steampunk!” according to my dear friend, Moxie Anne Magnus. Tomorrow, we will find out whether my story advances in the Iron Writer Spring 2015 Tournament by winning the Kurt Vonnegut bracket. I can’t tell you which story is mine, so you’ll just have to read all four and vote your conscience. They’re all good stories! Also, I hope to have more news about the first Tipsy Fairy Tales novel, Blue Spirit, any day now. This entry was posted in Fun Stuff, Silly Hat Books and tagged Girl in the Gears, ida and duffy, steampunk, Trans-Continental, whiteboard wednesdays. Bookmark the permalink.